Everything seems to be stuffed these days in my kitchen…not the same kind of “stuff” though. Wash the tomatoes and dry them. 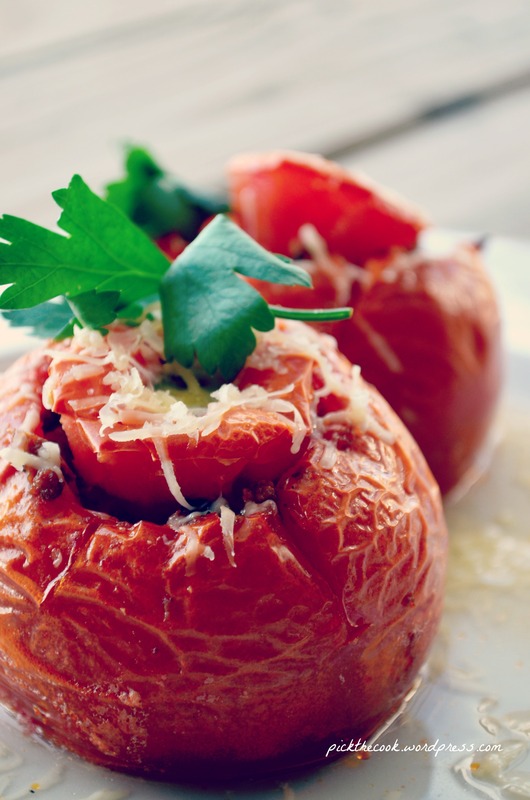 Using a knife and a spoon remove the core, the seed and the pulp of the tomatoes. Don’t throw anything! Use the upper part to hold in the filling and chop the pulp in small pieces. Chop the onion and 3 garlic cloves and sauté them in 2 tbs olive oil until the onion is soft (about 5 minutes). Add the tomato sauce and the fresh tomato juice and pulp, let it cook for 2-3 minutes, and then add the meat. Season with pink salt & pepper, 1/2 tbs of chopped basil and the bay leaf and let it cook for another 5 minutes. 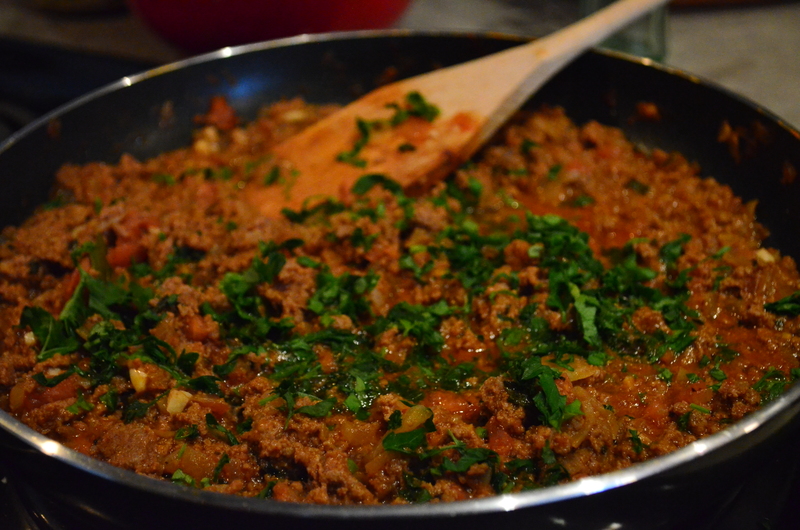 Chop some parsley (about 2 tbs) and add it to the sauce and remove everything from heat. I actually make a bigger bunch and I’m planning to use the leftovers for…we’ll see! 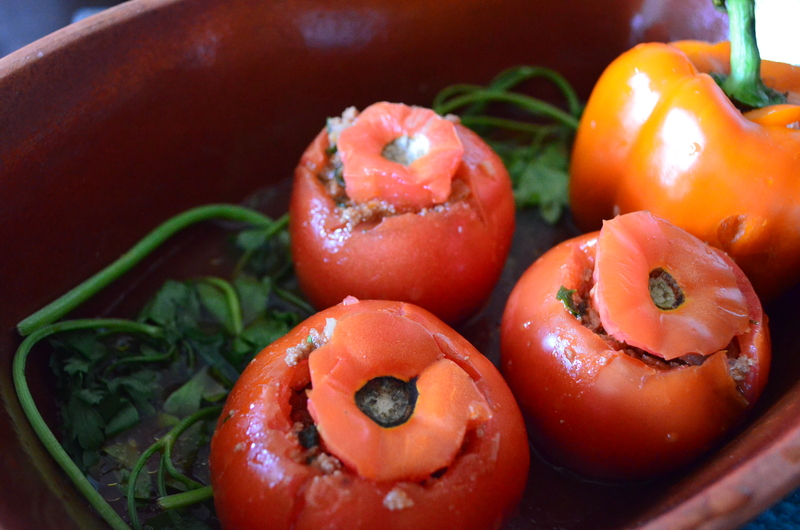 Stuff the tomatoes (I also stuffed a pepper) and place them in an oven safe pan (I used my terracotta). Mix 1/3 cup tomato sauce with some water, salt &pepper and add it to the pan. Chop the remaining garlic and add it in the sauce and you can also add some parsley leaves for extra flavor. Remove lid from panm increase heat to 400F and let it cook for another 20 minutes or so…until the tomatoes are soft. Serve with grated parmesan and rice.